This is the lowest price we've seen for this case. Whether you're building a new system now or stocking up on parts in anticipation of AMD's upcoming Ryzen release, now is a good time to pull the trigger on a case. That's because the Phanteks Enthoo Evolv is on sale at Newegg for $120 after mail-in-rebate. It's marked down to $140 outright, with a $20 mail-in-rebate available. That brings the price down to the lowest we've seen this case go for. The sale price applies to the gray version with a regular side window. Black and silver color options are available for a little bit more, and the same goes for upgrading to a tempered glass window. We used the mini-ITX version of this case in our recent build guide and found it to be a good buy for the money, offering a premium feel and features at a fair price. We haven't spent any hands-on time with the mid-tower variant, but suspect it offers a similar experience. 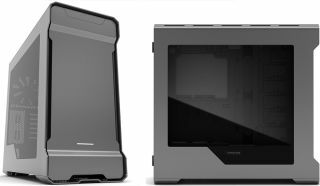 The Evolv sports a steel chassis with an aluminum exterior (3mm). It supports up to seven drives out of the box, including five 3.5-inch and two 2.5-inch drives. You can add another three 3.5-inch drives and another 2.5-inch drive by buying more brackets. For cooling, it comes with two 140mm fans up front and a 140mm fan in the rear. You can add another 140mm in the front and up to two 140mm or three 120mm up top. You can grab the Phanteks Enthoo Evolv on sale here.